Our story begins a little over one hundred years ago in Bern, Switzerland, where a young man employed as a patent clerk went off to work. He took the electric trolley in each day, and each day he would pass an unassuming clock tower. But today was different, it was special. For today he would pose to himself a question – a question whose answer would set forth a fascinating dilemma. The hands of the clock appeared to move the same no matter if his trolley was stopped or was speeding away from the clock tower. He knew that the electromagnetic radiation which enabled him to see the clock traveled at a finite speed. He also knew that the speed of the light was incredibly great compared to the speed of his trolley. So great that there would not be any noticeable difference in how he saw the hands of the clock move, despite him being at rest or in motion. But what if his trolley was moving at the speed of the reflected light coming from the clock? How would the hands of the clock appear to move? Indeed, they could not. Or if they did, it would not appear so to him. It would appear as if all movement of the clock’s hands had stopped – frozen in an instant of time. But yet if he looked at the hands of the watch in his pocket, they would appear to move normally. How does one explain the difference between the time of the clock tower versus the time of his watch? And which one was correct? There was no way for him to know that it would take three years to answer this question. No way for him to know that the answer would eventually lead to the discovery of matter and energy being one and the same. No way to know that he, this underemployed patent clerk making a simple observation, would soon unearth the answer to one of the greatest mysteries that had stumped every mind that came before his – the very nature of time itself. Where h = the distance between the mirrors, c = the speed of the light pulse and T = time. It is important to note that this is the way the light clock would appear to him, no matter if his trolley was moving or at rest. Both he and the clock are considered to be in the same frame of reference. Let the animated image above1 represent the clock tower as his trolley is speeding away. Once the trolley starts moving, he and the clock tower are now considered to be in different frames of reference. To calculate time on this clock will take some basic algebra and geometry2. According to this equation, the time between ticks of the moving clock will increase as the velocity (v) increases. Or put more simply – time runs slower for moving objects. Notice what happens when (v) is equal to zero. The equation becomes identical to our original of T = 2h/c. Now notice what happens when (v) is equal to or greater than (c). The equation becomes undefined. Thus the trolley cannot travel faster than or equal to (c), the speed of light. This includes all things with mass, and even gravity itself. If you keep following this rabbit down the hole, you will find that the speed of light, and all electromagnetic radiation, will always be the same for all frames of reference. This is counter-intuitive, but proven to be true. Keep going further and you’ll end up with one of the most profound revelations in all of human history – E = mc2. Remember these neat little facts next time you’re hacking away with lasers and wireless modules, and the spooky nature of the laws that govern them. More exactly, the energy has two components – one due to the mass energy, and one due to the kinetic energy. I hate how physics has “standard forms” for certain equations. I think the one above is better for beginning students because it fosters a visceral sense of understanding, but jargonism seems to be the rule. Have fun gaining a deep understanding of “the speed of light raised to the 4th power” (what the heck is that?). That’s not the full equation. It’s an expansion into a series to only the first two terms (of infinitely many). It shows how, at low velocities, the relativistic form simplifies to the newtonian form with a constant (mc²) added on top which doesn’t change the path a particle takes. When I was in college (197x) I read a book about relativity written by Albert Einstein himself and I don’t remember that infinite expansion serie. I just remember this two parts formula. E = MC^2 + (1/2)MV^2 Maybe it is because physicists now uses new mathematical tools to express that theory. In a century the theory is always the same but it as been scrutinize in many details. I think that the book was written that way because either the author didn’t understand it, or thought that the students wouldn’t understand it… hopefully the latter. ha, just re-read what you wrote, I have no explanation because I think that Einstein used Lorentz’s equations to explain space time in special relativity, which came before general relativity. maybe this work was written before Eddington had done his experiments, and was intended to ease his peers into the idea. To rectify the classical KE = (1/2)MV^2 you have to use the Lorentz factor ( http://en.wikipedia.org/wiki/Lorentz_factor ). This is only needed when v becomes a considerable percentage of c.
I agree that they tend to shorthand things too much, making it hard to understand for students.. But in the case of light which has no resting state/mass isn’t it sensible to simplify it? and this, is why you’ll never have the Wardenclyffe Tower be useful, because physics. I mean, as a device of pure terror I love the idea though. You can create quantum entanglement with a cathode ray tube (i.e. CRT display). Perhaps that is why we are discarding our “obsolete” CRTs? But not too freaky for hungry investors! Its fun how these people are always around and always entirely convinced and its always everyone else that is forming some massive conspiracy to maintain the establishment and quash utopia. Unfortunately reality is that history has shown that often an ‘establishment’ of scientist forced a certain state and then it takes some force to move it along. That is well documented. So that means in a sense there often is a ‘conspiracy’, although it’s not always clear in what area or sense. And of course there should be some counter-force to new theories that challenge well established ones, but an intelligent counter-force, not a lazy dismissal as often is the case. Yeah, except sometimes the NSA really is listening to your phone calls and reading your emails. An ad hominem argument against conspiracy theorists is still an ad hominem argument and does not discredit anything. Argue with science instead so as not to make a fool of yourself while trying to make fools of them. When there isn’t any science presented to argue with, I have nothing else. The burden of proof is on the kook to prove the results, and part of that is by providing a repeatable experiment that accounts for all foreseeable sources of error. “The establishment doesn’t want you to know” is nearly always a way to handwave away criticism, or even more damning to dismiss failure to reproduce the result. It’s not fallacious to point out this fact out, and not all claims deserve to be dignified with detailed point-by-point rebuttal, especially not on a goddamn website comment section. There is the small problem of funding, not only do ‘odd sounding’ things not get sponsored (they often enough have established older scientist help decide anyway), but also established scientist even actively attempt to prevent funding. And at that point it’s hard to produce experimental results. And of course in the case of research that might inhibit profit of some mega company things get even worse, not only do they fight people getting funding but they actively sabotage any attempt to get experimentation set up. Or positive results from experimentation to be published even. And that might sound paranoid but there are so many real life examples of it. Oh and last but not least, some things have military application and there research is done by the military but when a private entity tries to do research on the same subject they get it ridiculed and dismissed to prevent public dissemination. Isn’t a “tie-in” like a “sit-in” but where everybody wears ties? I want a black tie with a black HaD wrench logo, where it is only visible when the light catches it just right. I used to have a Mickey Mouse tie like that, which caused big grins when somebody noticed it during a corporate board meeting back in the day. These days I just telecommute, so T-shirts with cool logos (like the HaD T-shirts I just got) are more in order for my daily “business” attire. Was that a black tie with black mickey logos? That seems like it could be a little grim, when all of a sudden you see a glimpse of a giant cartoon mouse in the dark… terrifying. Yes. The decoration was woven into the tie, as a texture. It only showed when the light hit it “just right”, making appropriate for business meetings and such. I no longer have it — my son wanted it and I gave it to him. Now I want a hackaday tie to replace it (black on black, for formal and business attire, just like the “house of mouse” tie). 1.) Wouldn’t light coming from a clock that you were approaching arrive sooner making that clock appear to move faster? 2.) If you’re moving so fast that you’re outrunning (or keeping pace with the light from the clock tower, what light is bouncing off the face of your pocket watch? 1) the light from the clock you’re approaching would look more blue, the light from the clock you’re moving away from would look more red. The lengths of the light waves (and the frequencies) changes depending on the relative velocities of the two objects, particularly so as one approaches light speed. At the speed of light, when approaching the light would be so blue-shifted that the wavelength is effectively zero, and when moving away at the speed of light the frequency is effectively zero. Sure, the wavelength of the light is Doppler shifted, but also the frequency of the information it contains shifts. This is the mechanism that accounts for Einstein’s time dilation… The “ticks” of the clock appear to occur slower and slower as your velocity away from the clock increases. So it would stand to reason that if you were approaching a clock at high velocity that it would appear to move faster… The “tick” event would be encountered sooner… Right? So in reality there isn’t just one clock there are many clocks all with their own vector to your path of travel… all differently effected by the relative vector of your speed. Some appearing to slow to some degree while others appear to speed up. Wouldn’t this cancel out Einstein’s time dilation? I mean if clock A is ahead of you and clock B is behind – both outside of your frame of reference. One appears to move faster, one slower because of your relative motion… Isn’t it just the fact that your perspective is skewed and since both A & B exist in the same frame of reference aren’t they therefore locked together in the same time? The time decreases because the light travels a longer distance between bounces. This is because it is moving at an angle. These angles still exist when moving toward the clock tower. Time would still appear to slow. I think it is more localised than that, I always thought that your own personal circumstances would change to preserve the absolute nature of the speed of light. If you are moving near the speed of light, your own measures of time and distance change so that people moving at a smaller fraction of C always appear slower. Something to do with the fact that a beam of light shone off the top of a train moving at the speed of light still moves at the speed of light to all observers, as does the train to outside observers. I can see what you mean though, in water if you move forward through a set of waves the time between each event is shorter. I think in this example the fabric of space-time distorts so that no matter how fast you move the waves always arrive slower. I am no theoretical physicist though. Nice to think that entire conversation was parenthetical to Rusty’s point 2. 1. Their drawings seem to say that the exact opposite occurs. – That the effect when moving both away from and towards the clock looks the same. 2. IIRC the theory says that if you have a light source moving with you and measure the speed of light referenced to it, you still get c. Meanwhile if you measure the speed of light emitted from a source that moves close to c, it too supposedly yields c. – The discrepancy in energy is accounted for by the Doppler effect. I feel extremely vulnerable to misinformation in this territory. – I once got burned by a physics teacher who claimed that electrons without exception emit photons in a random direction, and this seriously sabotaged my education. Did you happen to tell the teacher if such was true, then lasers wouldn’t really work or is it just random all the way down? This was in our equivalent of senior high-school. I had not looked into how lasers worked back then, but my intuition told me that something was up and I did press the point in class until the teacher lost her temper at me. Now a decade later when I went back to figure out how lasers actually worked I was in for a bit of a surprise, to put it mildly. I should have trusted my intuition. You got me curious as to what you’re rebuttal was to her and what her argument as to way you was wrong. Even outside of the example of how lasers work, I would think that just the action of the atom itself during radiological decay would be proof enough to her to figure that she was wrong. “Random?” Maybe by wavelength but even then, photons can radiate in an orderly (mostly) fashion. @Rollyn01 – Have you ever heard of “wave guides”? They are man made and do not occur in nature. Photons are NEVER coherent in direction without help from humans. So Ganzuul’s science teacher was correct. She was also correct in saying “How I was taught 30 years ago” implying that academia has a habit of making sea-change shifts in science from time to time (i.e. size of the universe?). Einstein would have loved these questions. Most historians say that Einstein had two great strengths: 1. asking good questions, and 2. accepting whatever answer he reached. The answer to both of these questions is shocking, and not just because the answer for both questions is the same!? (chess notation usage). The answer is this: what Einstein discovered is that the speed of light is always, I repeat, is always measured the same no matter how fast the observer and source are going. So, if you could close in on the speed of light as you travel away from the source it would still “hit” you traveling at speed “c”… now, what you see when you look into that light changes if you’re running away or running towards (object going slower or faster, shortened or elongated [yes, both time and -space- are affected]). Wait, I promised you an even crazier part. What this means is that the speed of light is a constant in the universe… and that means space and time (itself) are not. So, in order for light to always be seen as traveling at “c” no matter what, space and time have to bend to allow for it. So, the distances -between- the distances change! And now we reach 4d stuff and we need an hour and some drawing tools to go on. The clock story above is fun, but maybe oversimplified. Einstein didn’t simply “think” that question and 3 years later come up the special theory. He was pondering the Maxwell equations, and Maxwell discovered that photons always traveled at “c” in his experiments, no matter how they were viewed… but Maxwell thought this was a “special” circumstance. Einstein did what he was famous for, and accepted the end result of his “clock” postulation, and said “well, speed must always travel at “c” and space and time must be flexible; which was something his contemporaries weren’t willing to do. Einstein took that idea, did a lot of math using that postulate, and borrowed a tremendous amount of help from the (wrongly) forgotten Lorentz and gave us the poorly named “special theory of relativity.” It was called that because it was a “special” case where Newton’s Laws didn’t apply… but, it turned out, Newton’s Laws were actually the special case. But there have been experiments that have pretty definitively shown that C is not constant. There was one experiment where C was reduced to 0 (zero) within a Bose-Einsteinian condensate. I wont link to the pages that explain this in depth, as you can find them with a search- but in a nutshell, the speed of the photon didn’t change, its time across the substance was slowed by constant absorbtion/re-emission as it crashes into, is absorbed by, and eventually re-emitted by atoms (and fields related to crystal structure in dense objects) its passing though. Same way that light “takes longer” to work its way through a diamond. But during any phase of uninterupted flight, even in a diamond, its speed is still “c”. First of all I have never heard that MAXWELL was capable of *measuring* SoL. Just like Einstein they never DISCOVERED anything. They just postulated theories that some other scientists proved (allegedly) later. One must remember that the SoL in the algorithm that C (or Celeritas) is in is only in a vacuum. C can be slowed down depending on the medium it is in. Try firing a laser in seawater. The USN has found a way but it involves a blue-green laser. “photonic crystals” * to slow down ring-laser light and in his theory causes frame dragging with time. He purports that one day soon he will be able to send a gauge boson backward in time by 1-second initially serving as a message to himself that it works. Photons are not mass-less hence they are inhibited from going any faster than C (per Einstein that is) *. However, PULSARS have exhibited FTL features which are puzzling to us. Pulsars make scientists question Dr. Einstein and Dr. Bose theories. Also Pulsars are the only energy/mass in nature that exhibit coherence or a straight line without help (wave guides) from humans. How is the mystery. The recent inventions of Dr. Ning Li and Dr. Eugene Podkletnov will cause a sea-change effect on the present MIS-understanding of gravity. Their gadgets have proven that gravity must be some sort of heretofore unknown energy emitted by theoretical gravitons. Why? Because they’ve proven that gravity can be blocked or mitigated with special materials. And Dr. Podkletnov has even discovered a way to repel gravity. All of this would be impossible in Einstein’s concept of gravity. 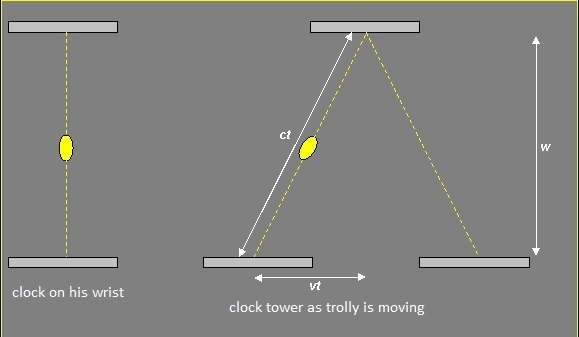 Doesn’t this clock tower example make the assumption that the speed of light does not compose with the speed of the trolley ? Otherwise the speed increase and distance increase would cancel out and you’d be back to classical physics. You can’t then say that the fact that the speed of light is a constant is a consequence of these equations, that would be circular reasoning. I think the constant speed of light in all frames of reference is one of Einstein’s postulates. @Jacques since 1956 – Everything Einstein did was only postulates. He never discovered anything nor invented anything. He was simply a deep thinker. And no your Michelson Morley experiment was the most failed experiment ever and it was BEFORE Einstein did anything. He was only 8 years old living in Munich at the time. Yep, you’re right [vic]. I should have explained it better. It was a) the speed of light is constant for all frames of reference. Then b) time dilation. My wording has this backwards. Thanks for the catch! I very well may be stupid, but I never understood this thought experiment. Basically what Einstein is saying here is: 1) I decided to measure time in a certain manner 2) I then came up with a situation where my measuring device fails 3) Now I BELIEVE that time behaves differently in this situation based on measurements from my device. This doesn’t make any sense to me. Similarly, I could set up a thought experiment where I drop a hourglass from the plane. As it goes into a free fall, the sand falls slower, so time is slowing down. Thus, time is stopped for free falling objects. Which obviously is nonsense. To me, his equation becomes undefined at speeds at or above speed of light, not because you cannot move at such speeds. It simply means that the device you’re using (essentially a method of observation you selected – registration of light) will not be registering any light that came from the tower clock at moments after you started moving at speed greater than c. However, you should start registering the light which was emitted before that. But in any case, these are just your observations of light, not the actual flow of time. I.e. the aging will still be happening the same way. If you relied on “ticks” made by the sound coming from the tower clock, would you make a conclusion that when you’re moving away from the tower at speed of sound the time stops? And that you cannot possibly move faster than speed of sound because the equation for it is undefined at this point. The problem is that physicists over the last century have made so many experiments that prove the theory correct. Even GPS satellites take general relativity theory into account to avoid timing error. Without the due correction our GPS readings would be errornous. So I guess they are right and your are wrong, even though I don’t understand much of it. I believe this way of thinking prevents us from making new discoveries. There are at least two possibilities: 1) Einstein just got lucky and there is really nothing in the universe that can move faster than light. So his theory, although wrong in principle, can never be proven wrong. 2) The methods we’re using for those experiments rely on something that depends on speed of light, thus it is possible that the tools themselves are biased this way. All sophisticated tools we have work on some form of electromagnetic interaction. Again, same example with sound – if we only relied on hearing, our view of the universe may have been completely different, and we may have never detected anything faster than sound. So again, as deGrasse Tyson says – question everything. The fact that we cannot observe something doesn’t mean it doesn’t exist. May be different approach is needed. I understand there a lot of Einstein thought experiments, and they are frequently cute/simple/childish and make it seem like Einstein did all this stuff based on postulates in head… but this whole thing came from measured science. What happened was that Einstein read about Maxwell coming up the “Maxwell equations” and Maxwell noticed that photons always appeared to travel at the same speed, no matter which direction the source and the photon was moving. We have deduced that “c” is the limit of speed in the universe simply by the fact that all “massless” particles travel at that speed. When there is no boundary to how fast a particle can go… they hit the universal limit, which is “c”. Hope that helps. Well, yeah, c as max speed is clear. I guess what I was saying is that if you choose a medium, then you choose a method of observation within that medium, and then you come up with equations based on your observations, it is obvious that all observations will match those equations. Those equations will be describing the nature of that particular medium. But, you may not necessarily be able to make conclusions about things outside of that medium (e.g. conclusions about how time behaves may not be made based on our observations of electromagnetic radiation, which is the main thing we’re using). An analogy. Say we decided to observe a pond. All our measurements will be made based on the disturbances of the water surface. Yes, we will find out that there is a speed limit to how fast disturbances (e.g. waves) propagate. Yes, we will also find out that regardless of speed or direction of a boat, disturbances from that boat will reach the observer with the same speed. Even if two boats move towards each other both with speed of 0.8 of max propagation speed. We can come up with equations describing every possible observation that can be made in this medium and they will be correct. However, the fact that any measurable movement tops at some speed doesn’t mean that time behaves differently with speed. It also doesn’t mean that it is impossible to break that maximum speed. It only means that at those conditions, observations which are based on registration of waves will not produce a clear enough picture of the reality. It may also mean, that in order to break that speed you may need to leave the medium. That’s fine, I can fly above water with speed magnitudes higher than the speed of waves. And such event doesn’t mean time is going backwards. If you take a look, most measurements are made via observation of disturbances in electromagnetic field. That’s why all equations describing e/m field correlate with all measurements. If light is a such disturbance, everything about the pond above applies to light as well. However, if you try to setup an experiment, that goes beyond this medium, it is possible that some other observations can be made. Like trying to directly observe gravitation as in the article I linked. ha. Just for fun tried this thought experiment. Let’s assume there is an object that moves past you twice as fast as light. What would you see assuming you can only register it’s position using light? Turned out no matter what speed for the object you choose it will always appear as moving below the speed of light. In my case, v=100*c gave me apparent speed of something like 0.94c. For some reason i cant respond directly to your replies, must be some web issue i dont understand. Hopefully you will see this anyway. I appreciate what you are saying (all but the math of apparent speed? Im not sure what equations would give you that, as its not a lorentz transformation? ), and i took some time to review that article. I agree there is much we dont know about our pond. Dark matter, the strange attractor, and quantum entanglement are just a few. In fact, recent radio telescope observations have shown that our universe is expanding “evenly” at its edges implying that our known universe is just a bubble in something bigger, or one of many other bubbles. Id like to say, after reading that article, that being cautious of the sensational is always good advice. Much like your analogy of waves in a pond, wave “heights” can be made to move faster than light. In fact, a powerful laser on earth rotating once every 6.9 seconds would cause a dot of laser light to go across the surface of the moon much faster than light… which is basically what most of the examples in the articles are. Even though that laser dot goes “faster” than light, “information” or “causality” cant. A person at one side of the moon would still have to send a message to earth, at the speed of light, first. This idea is what most of the gravity article ignores. Gravity can only propigate “causality/information” at the speed of objects moving in it. If you’d like more to consider, when supercoliders accelerate particles close to a noticeable fraction of the speed of light, all the rules of relativity have applied. “But what of outside the medium?” Who knows what is outside our bubble, could be a universe where pi is 12, or a universe = sqrt[-goldfish]. But as doctors say, when you hear hooves, think horses, not zebras. I applaud your desire to disbelieve the status quo, Einstein did the same and it took years for his realizations to be accepted. Another poster, Mike, might be better able to take this conversation over and work some equations. Cheers! I should note that this doesn’t even need quantum mechanics – and while those have not been *directly* detected, we have indirect evidence for their existence. As for a ‘medium’… unlike most (all?) other waves encountered, EM waves do NOT need a medium. They are self-propagating – the Michelson–Morley experiment knocked out the idea of a medium (the luminiferous aether as it was called). Also, for the boat problem – you can stick clocks on the boats and see if your measured observations about speed match what is expected for the behavior of time. Which has not just been done experimentally, but actually is necessary for things like GPS equipment (not that everyone hasn’t brought that one up already). Maybe at some point physicists will make an experiment that don’t agree with the theory and will have to revise it or create a new one. I’m fairly certain the church forbids this. No sense going all Galileo again, now is there? Realize that he didn’t exist in a vacuum. All the axioms of relativity were already known. The problem was other conflicted ideas also existed at the same time. He was the first to reduce the set of axioms and see where they led. He constantly thought about racing a light beam. Thinking about clocks and relative motion is what led him down the path to throwing out unnecessary ideas. The idea of seeing one clock as stopped, and another as running normally led him to the notion that time can run at different rates depending on relative motion. Poincaré’s paper “The Measure of Time” and his book, “Science and Hypothesis” are good reads to understand what was going on in that time. What does it means to space in space-time ? The part missing is; “to be able to see the clock ticking”. If the trolley was moving faster than light the bouncing lightray would never be able to reach it and the Pythagorean Theorem would not apply. That’s why the equation becomes undefined. Now please continue with the “rabbit hole” explenation? I would like someone to answer why it is undefined and not an asymptote. Asymptote is a curve which usually depicts an equation that is undefined for some of its arguments. The equation is undefined for v=c because that would produce 1/0, and is undefined for v>c because that would lead to a square root from negative. A curve plotted to show DEFINED values, will come infinitely close to the undefined area, but will never reach it. Thus it would be asymptotic. My question was leaning more towards why is the equation written so that it could be undefined. The ‘light clock’ is a thought experiment, and the best way imo to demonstrate the math. It would make more practical sense to apply the equation to relativistic mass increase or length contraction. But that gets complicated. Bill Gaede on you tube will change your mind. But you have to start with an open mind to undo all the axioms you have assumed. Didn’t EINSTEIN fail Algebra in grade school? Wow, just wow. This checks nearly all the boxes. The only thing any of these people has to do is provide some math showing a result calculated by relativity that differs with experiment. Not a single SR equation in the entire video. The wire thing the guy screws up from the get go and runs with it. First he claims that in the first Veritasium example when the “cat” isn’t moving that the density of electrons is higher. That isn’t what the video says. It says they are equal. Second, he keeps calling electric and magnetic fields two different things and getting all confused when they get used interchangeably. Its because they aren’t two things, they were combined into one force long ago, the electromagnetic force. The spaceship thing is similarly a fail. The math is completely unambiguous. If he’d just do the transformations he’d get one single answer. Similarly with the closed loop, he just doesn’t bother trying to understand transformations, he just gets confused and gives up. He then comes up with his own equations. At this stage, it should be dead simple just to show where their results differ from the results for SR, perform the experiment, and collect his nobel prize. Relativity does not bolt onto Maxwell, it takes them at face value. The homopolar paradox thing is silly to, he says it only depends on absolute velocity, but he’s confused that with rotation. I don’t know anyone who refers to this as a “paradox”. It was understood even before Maxwell. Again, all he needs to do is show the SR equations that calculate that this is a “paradox”. Any experiment that showed that absolute motion mattered would also give him his nobel. He then proceeds to misrepresent lorentz transformations in the worst possible ways. More atoms? Metal fatigue? Blow seals? Its like he’s trying to be funny, but it really is a complete lack of understanding. If you are going to “break relativity”, at least try to gain a layman’s understanding of it first. Again claiming ambiguous gibberish, but not showing how the equations can give you more than one answer. His wave drawing absolute effects is just so confused, I don’t even know where to begin. He then claims that general relativity somehow ruins stellar aberration. I really don’t see the whole point in watching another one of his videos to see him try to hand wave that one. He mentions ether motions, if those effect light, then they can be measured. If they don’t, then they can’t explain stellar aberrations. We went over this, more than 100 years ago. I rofled when he claimed that most of the bodies in the solar system are in a circular orbit. These types of things has been around for a very long time. No matter how much information you put out there, no how many experiments you do, they’ll always claim the same things and never provide any type of experimentally verifiable evidence. He was very frustrated with this Myth. He did, on the other hand, fail out of nearly every other subject he took which is how the myth started. But, he once frustratedly replied to this question, “Before I was fifteen I had mastered differential and integral calculus”. What has always confused me with this topic is when people say if you moved away from earth at the speed of light then came back (if your trip took 1 year relative to your frame of reference) that people on earth would have aged something like 10 years or more. You move away to a distance of 1 light year at the speed of light, so when looking at earth you would see light that is 1 year old. But when you travel back to earth, again at the speed of light, wouldnt that just be another year so when you get back its only been two years? Just reading the muon decay experiment that was linked before i hit post, it makes a tiny bit more sense to me, but im still not convinced. Alright, so, what’s going on here… As you’re going closer to the speed of light, time dilates for you – so it ticks different for you than for observers back on Earth. So when you’re looking back on Earth, it looks like they’re “moving at super-speed” The light, from your perspective, still travels with speed c from the Earth even though you’re traveling away from Earth at speed near c (and exactly the same coming back!). The only catch, is that when you’re traveling away, the light gets red-shifted, and it gets blue-shifted on the way back. However, where you’ve heard this ‘problem’ before is the “Twin Paradox”. According to relativity, there are no preferred reference frames.. Which means you could look at the problem as the Earth flying away from you, and back, instead of looking at you moving away and back. In essence, this means that Earth is travelling away (and subsequently toward) you at speed near c, and time for THEM should dilate, and the trip that’s only a year for you should only be ~1month for them! Again, nothing in special relativity stops you from looking at the problem like that! However, if you were to do it, you’d find that there is a definite solution – YOU will be time dilated relative to the Earth. The reason… you accelerated (in your spaceship!) away from the Earth. Special relativity doesn’t work, and you need to go to general relativity, and working though that resolves the paradox. Alright, hopefully you’re not even more confused after that longwinded diatribe! Hope that it helps! Mike answered this excellently. I think the whole time travel/general relativity thing is really confusing, because it’s hard to understand/envision what is going on in words. If I can just chip in another way to think about it: in a not very accurate, but hopefully clearer way… perhaps with an answer “the Doctor” might give. Imagine a ball thrown straight up in the air… as reaches the top of the arc it slows down until it eventually “stops” for a split second. During that time, when it’s close to stopping, has stopped, and then just started down, it seems to defy gravity and looks still, almost frozen in the air. It could almost be said the effects of gravity on the ball don’t count for those small moment in the middle of the acceleration curve, as the ball doesn’t seem to be moving. Then gravity catches back up with it and it accelerates back down. This same sort of idea is what happens with a large acceleration in space… Someone travels away from earth very fast and they appear to moving slower than they are, and then they change direction to go back to earth and they look like they are going faster. During that small period of great acceleration in-between going out and coming… in it’s almost like time doesn’t count until they “catch up”. They seem almost frozen in time and those on earth seem to be moving very fast. Hope that’s easier to understand. This stuff is much easier to draw out. Thanks! And you’re absolutely right. Its so hard to explain relativity in words; I’m including equations in that. I wish there was a way i could post a few graphs of Time vs. Distance… it made so much more sense to me when I saw space/time represented in some 2d graphs the first time. I always thought there might be a good explanation you could do with digital slit-scanning effects. Or at least, have some video (which can be viewed as a 3d array of pixels) and the relativistic effects shown as distortions in the “slice” of time (frames) we are seeing at any one time. Given we unfortunately cant picture 4D things in our heads, certainly lower dimensional analogys are the way to go anyway. So, in essence, to get closer and closer to c, you need more and more energy, to the point that to actually reach c you need an infinite amount of energy. You’ll also notice that at that point you’ll have infinite momentum – and anything that actually tries to stop that will soon learn the meaning of an ‘irresistible force’. Lastly, bonus points if you can figure out where E=mvc/sqrt(1-(v/c)^2) *doesn’t* go to infinity for v -> c! (and that will explain a couple interesting things for you). Alright, that’s enough rambling from the resident physicist student lurker… signing off! Only light doesn’t does it? And electricity is near light speed (I think) and that doesn’t either? so there seems to be exceptions somehow at least for individual particles/photons. Or are these the exceptions you mention? As for “a beam of light approaching you from behind” – is this a consequence merely of seeing the beam as “one thing”? Because in order for the clock to seem to freeze if your traveling away from it at C, there must be light bounced from it that never reaches you due to your speed. And in a wire, while the electrons don’t travel at speed c, the electric field (and via Maxwell, the voltage, or motivating force) does! And Gravity is a whole ‘nother can of worms. However, it’s propagation should still be limited by c – if not, you could blow up stars and transmit information faster than c! And that should tell you some information about the theorized ‘graviton’. Lastly, a beam of light, independent of how fast away from it’s source you’re traveling, *WILL* pass you at speed c. Period. If you are standing still, it passes you at speed c. If you are traveling towards it at speed c/2, it flies by you at speed c. If you are traveling away from it at speed c/2, it still passes you at speed c. If you are traveling towards (or away) from it at speed c… you guessed it, it still passes you at speed c. And finally, if you’re traveling faster than c, lets say at 10c, it STILL passes you at speed c. The way this happens is that your time frame is dilated (not just perception, but your *actual* time). And if you go faster… then the only way for light to pass you (in your time frame) at speed c… is that your flow of time, in your reference, is going backwards! Look at it from the perception of an outside observer – if you’re going 10c, and the source of light is behind you – it will obviously never catch up to you, how could it? But it will still pass you at speed c. Period. The only way then, is for your time to go backwards (you’ll see the universe play in reverse). So, you’ll see the light from the source fly right past you. That “What If” was the funnest story I’ve ever heard regarding physics (aside from a couple of parts of “The Universe in a Nutshell”). Thanks for giving me a new bookmark. Article says “Thus the trolley cannot travel […] equal to (c), the speed of light. [The same is true for] all things with mass, and even [for] gravity itself.” But my understanding is that gravity travels at precisely the same velocity as light. See “Speed of Gravity” article on Wikipedia. We are still struggling to define and understand gravity really. And the same for time. Once (if) we do we will have made a gigantic jump forwards. I have always understood the whole time appears to move slower/faster thing – thats pretty easy to get in your head. I will quibble slightly about the explanation above – as it only works as long as you assume that pulse doesn’t inherit the velocity to start with. (which I think needs to be proved separately as without that the logic is sort of circular no?). Anyway, Its how you go from that too proving time *actually* passes quicker or slower I have always struggled with. Clocks of airplanes and gps and such certainly go slower – but They arnt things bouncing back and forward – its decay rates being measured right? And it doesn’t even have to be motion merely changes in your gravation can cause dilation too. So in many ways it still seems odd to to me that the “apparent” time merely from distance/light travel duration is in sync with the “actual” dilated time. The confusion only comes about by thinking about space and time as two separate things. They are a combined thing. Just as you can take the long way to San Francisco, or the short way, you can take the long way to a point in time or the short way. Sorry, but I dont see how that applies to my comment. I do see spacetime as one thing. That i find very easy. My question was about why one thing proved the other – and why the two should be in sycn at all. Imagine it the other way around if you like; Imagine we didnt see with light but with something that travels slower. Would you still expect the distortions of space time due to things traveling at speeds to exactly match the prorogation of information in this new medium? Thats why I don’t like the “as you move away from the clock it seems to go slower” thing put forward so often – as no explanation is given for why the apparent time on the clock bares any relationship to the actual difference in time between your local time and the time at your departure point. There could just as easily be 3 different times. (apparent time on clockface, local, and departure point time). Why should departure point time match the time of flight of the light that hits you as you go away? why should the time of flight of a medium carrying information match the bends in spacetime due to your speed? And my other comment about the bouncing photons on a trolley; The explanation above assumes no inherited motion that would supply the photons with a extra component of their speed in the X-axis. I have no dought this has all been proved experimentally, but as a thought experiment it doesn’t seem possible to just rule that out. Generally speaking, if a ball hits a moving object because it doesn’t bounce instantly, it inherits part of the motion of the object it hit. It could go the other way too – the mirrors could move in X and the particle bouncing might not – meaning the particle just completely escapes the mirrors after the mirror moves half its length. I was under the impression the mass energy relation came from his work on the photoelectric effect, not from relativity. Thank goodness someone still has the sense to include math in science. I’m so annoyed that Scientific American has banned math (and lately science altogether) from every article. I’m not insinuating anything, but if someone who really doesn’t know the first thing about special relativity were to write about it, the result would be indistinguishable from this article. The fact that the velocity of light is independent of the frame of reference is the basic assumption of SR, not its result. If you haven’t heard of Michelson-Morley, *maybe* you shouldn’t write about SR, or at least a visit to Wikipedia would be in order before doing so. So what happens when the trolley that is moving at light speed turns on it’s headlights? @Alex – I’m not sure but if I were to use the analogy of a fighter jet in Vietnam War, if it was flying at MACH 1 then firing it’s guns would be pointless. Why? Because he is traveling at close to same speed of his fired ammo and he would either fly along with the fired ammo or outrun them. So empirically the US military had to compensate by using missiles that could outrun the jet to target at MACH 1. I think either the trolly would have no forward illumination only glowing headlights with no propagation or maybe the headlights propagate outward at C*2 which seems impossible to me as photons are not mass-less and would be impacted by the C speed limit. I also can’t see how the trolly could approach C as the trolly’s (and pilot’s) mass would grow exponentially to disintegration as Einstein postulated. A light clock is working in a moving train. Light path of light clock is illustrated vertically (in books). But this light clock leans somewhat to the right (or to the left). So, to an observer who stands on the ground, zigzag of the light path (saw-tooth like) warps. Two kinds of dilation ? And if two clocks work, and if these lean differs ?